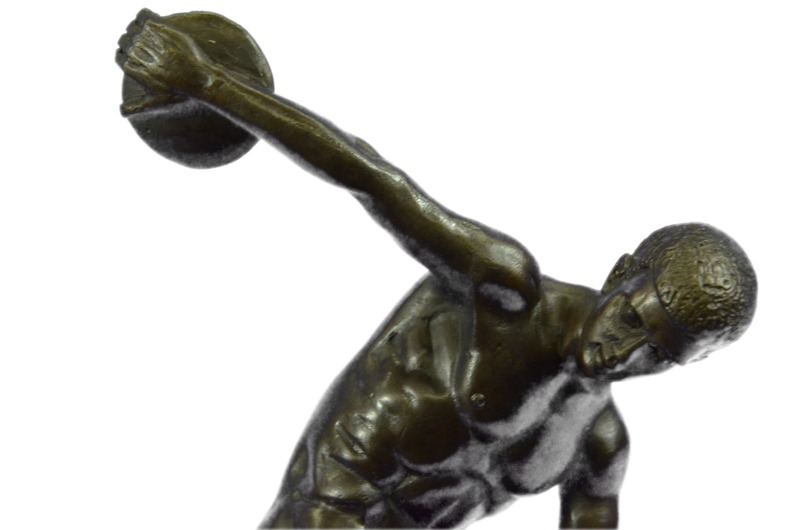 This Is A Bronze Replica Of "The Discobolus Of Myron" Which Is A Famous Greek Sculpture That Was Completed Towards The End Of The Severe Period, Circa 460-450 Bc. 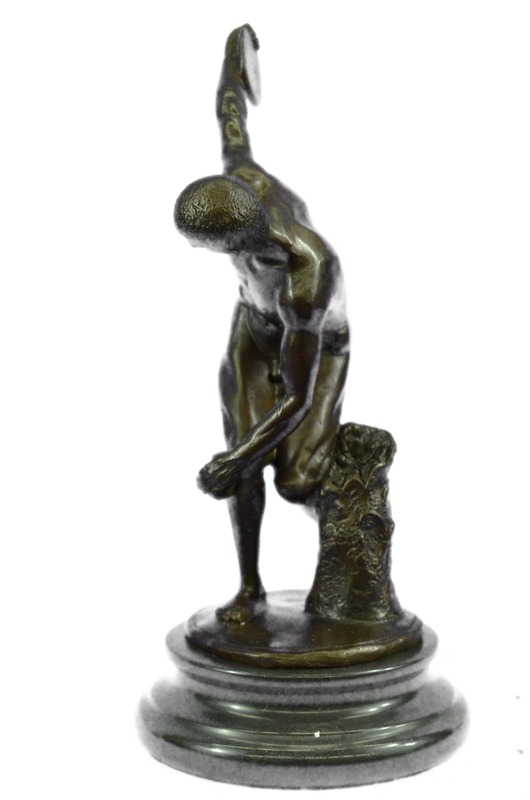 The Original Greek Bronze Is Lost. It Is Known Through Numerous Roman Copies, Both Full-Scale Ones In Marble. 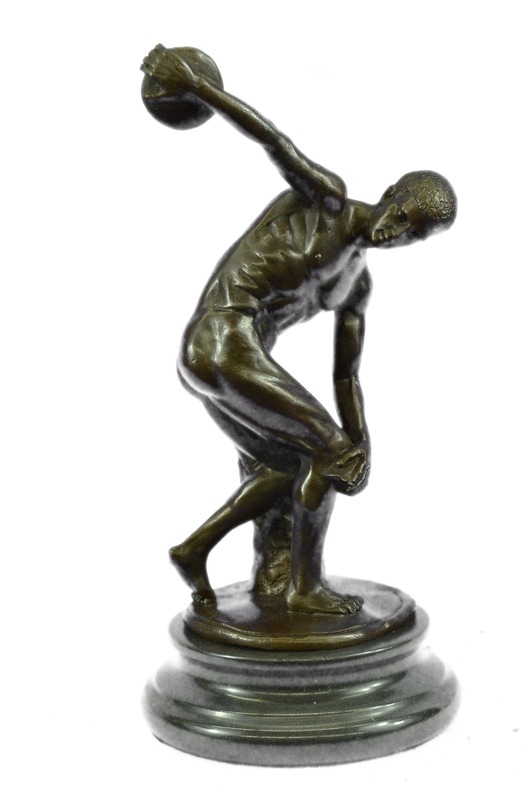 Here A Discus Thrower Is Depicted About To Release His Throw. 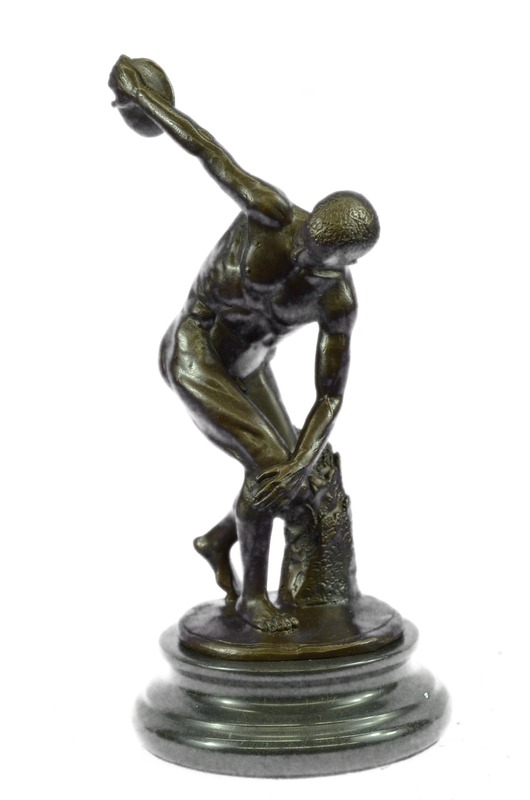 The Moment Thus Captured In The Statue Is An Example Of Rhythms, Harmony And Balance One That Has Endured A Pattern Of Athletic Energy. 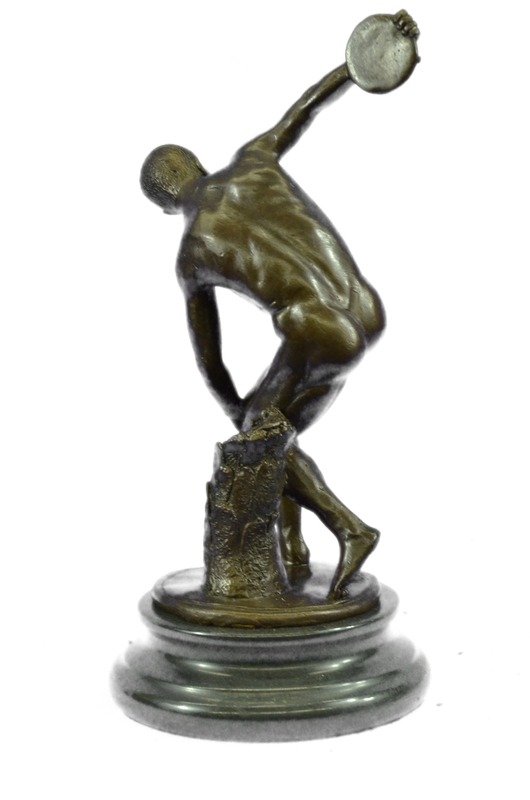 The Potential Energy Expressed In This Sculpture'S Tightly-Wound Pose, Expressing The Moment Of Stasis Just Before The Release, Is An Example Of The Advancement Of Classical Sculpture From Archaic. 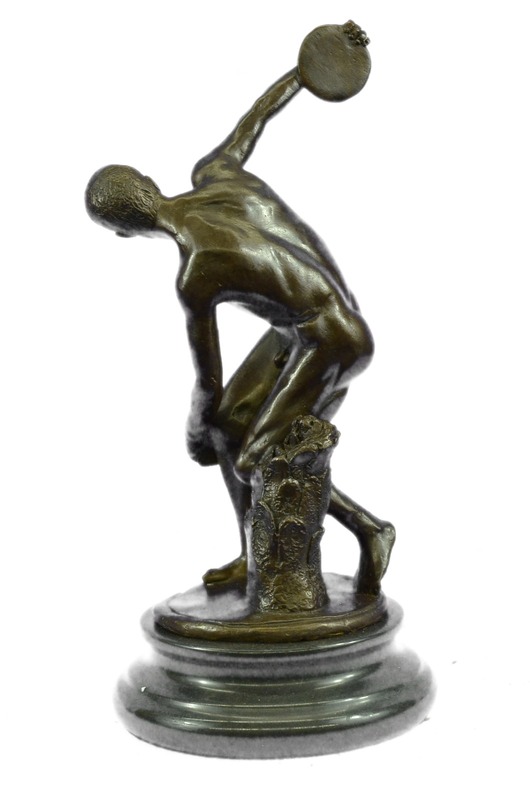 The Sculpture Was Cast Using The Early Method Of Lost-Wax Casting And Stained With A Brown Patina Finish For Preservation. 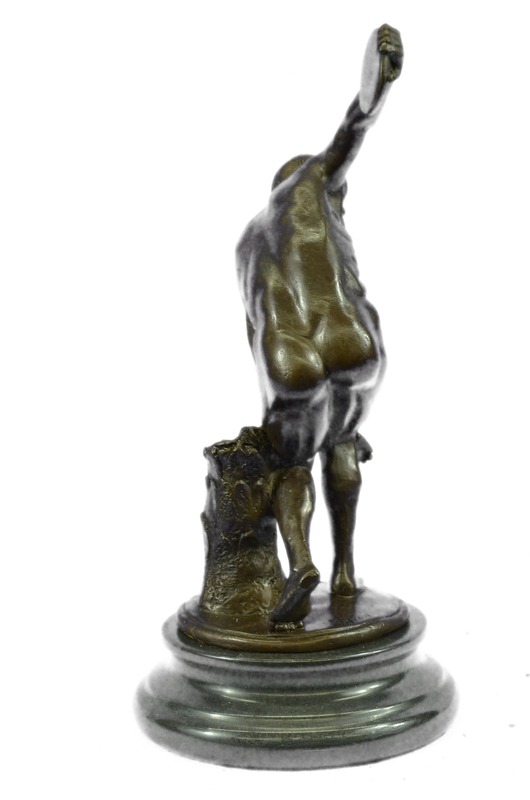 It Is Mounted Upon A Black Marble Base With The Artist Myron'S Signature. Myron Of Eleutherae (Greek) Working Circa 480-440 Bc, Was An Athenian Sculptor From The Mid-5Th Century Bc. He Was Born In Eleutherae On The Borders Of Boeotia And Attica. According To Pliny'S Natural History. 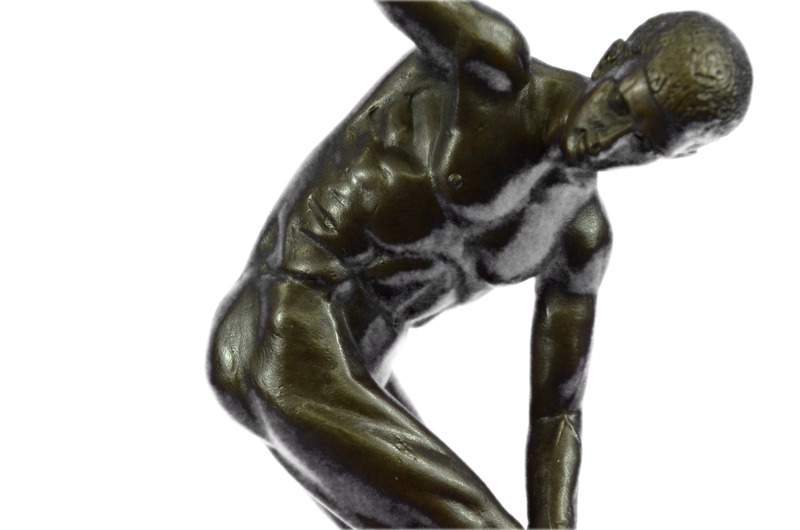 He Worked Almost Exclusively In Bronze, And Though He Made Some Statues Of Gods And Heroes, His Fame Rested Principally Upon His Representations Of Athletes, In Which He Made A Revolution, According To Commentators In Antiquity, By Introducing Greater Boldness Of Pose And A More Perfect Rhythm, Subordinating The Parts To The Whole.